Discussion in 'Online Games - News and Reviews' started by Kotsy, Oct 12, 2014. Magic 81 Lines™ is a very interesting online video slot. I haven't seen anything like this in a long time. up stuck. This video slot can really bring in some nice winnings and for some reason made me feel like I was playing in a land based casino. Spin after spin, I really got into it. 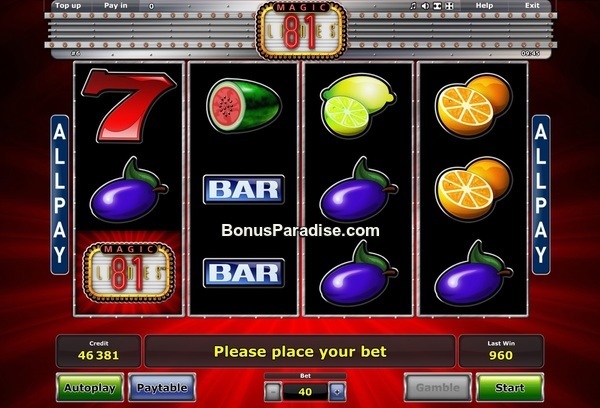 This very simple and basic slot game has the familiar aviance of the Novo fruit inspired slots. Mystery Star is your basic fruit symbol slot and Sizzling 6 has that added something extra. Seems like Magic 81 Lines has married these two slot games. displays some interesting lights to alert you of a winning combination. You'll here the ca-shinging sound and lights will flash across the top of your screen. Magic 81 Lines™ is a basic online slot, but has some added excitement. There are no free spins or bonus rounds, but all slot players will enjoy it. lines and bet amount with a simple click. Check out the paytable to see what your spinning for and the amounts of wins to be had. Winning symbols for Magic 81 Lines™ include Red 7's that bring one of the highest payouts, Watermelons, Grapes, Plums, Oranges, Lemons, Bar symbol, Cherries and the ultimate is the Magic 81 symbol. This symbol is wild and when it appears in a winning combination could bring you up to 8x's the winning pay line. Step back and play Magic 81 Lines™. You may think basic, but it surely has a twist and some great winning to end up in your pocket. Stargames will have you in the winners circle with this one. Mike and Goldharry like this. Magic 81 Lines should launch at Stargames Slots on 15 Oct 2014. Good luck to all who try this new game. Mike, Kotsy and Goldharry like this.